The Washington Heights Congregation has a venerable history. It began in 1905 when a small group of worshippers rented a hall on 157th Street and Broadway for holiday services. 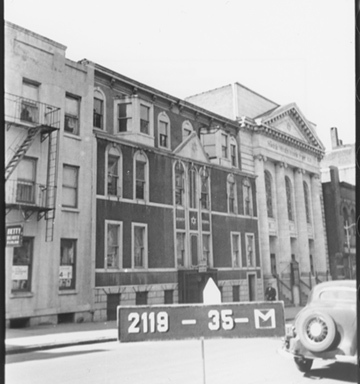 This may have been Corrigan's Hall at 561 West 157th Street, which the shul's minutes show was used for the same purpose in the early 1910s. 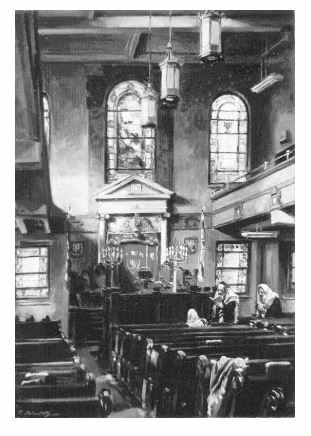 In 1906, they formed a congregation, renting a space in which to meet regularly and electing Isidor Kottle ע"ה, (c.1863-1933) as President. On 14 September 1909, the Washington Heights Congregation (also referred to as Congregation Bnai Israel of Washington Heights in early shul records) became legally incorporated in the State of New York. In October of the same year, according to the New York Tribune, the shul bought the lots at 508-10 West 161st Street, planning to raze the two frame houses there and build a synagogue for $50,000. In the meantime, they used one of the existing buildings for services. 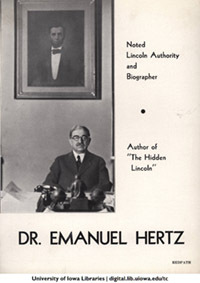 In 1913, the lawyer and distinguished Abraham Lincoln scholar Emanuel Hertz זצ"ל) 1870-1940) became President, a job he held for the next 15 years. The success of the shul in establishing itself as Modern Orthodox and very definitely Zionist is due in no small part to his leadership. Isidor Kottle was much more than the first President of the shul. Variously listed in records as a silversmith, jeweler, and cutlery manufacturer, he came to the United States from Hungary in about 1885. The census lists his native language as Hungarian. His wife Rose, who was born about 1880 in Austria, spoke German. In 1900, according to the census, they lived on East 82nd Street and had five children: Louis (b. 1886); Lottie (b. 1888); Dora (b. 1890); Eddie (b. 1892); and Lilian (b. 1898). Until at least 1906, they lived on the Upper Eastside, but in 1908, they listed their address as 533 West 158th Street in the membership books of the prominent charity, Hebrew Orphan Asylum of New York. This also was the address that Isidor Kottle and his son Louis used when they signed the shul's Certificate of Incorporation in 1909. Together the Kottles outfitted the new Washington Heights Congregation. He supplied it with a sefer Torah and prayerbooks, while his wife embroidered covers for the scroll and the pulpit, among other decorations. Unlike many of the founding members of the shul, the Kottles remained in the neighborhood. By the 1920s, they had moved to the recently completed apartment building at Riverside Drive and 161st Street. Their son Louis, still living with them, worked in cutlery manufactury, while their younger son Edward was a cutlery salesman and lived at 600 West 174th Street with his wife Sophie and two daughters Leah (age 5) and Harriet (age 2). By 1930, this Kottle couple had moved around the corner to 700 West 176th Street. But the only mention of any of them in later shul records appears in a letter written in 1945 to the youngest daughter, then Mrs. Lilian List living on West 72nd Street, asking for information about her father to put in a history of the shul. There is no record of her answer. With the election of Emanuel Hertz as President in 1913, the Washington Heights Congregation became associated with a figure of considerable renown. Mr. Hertz came from Austria (now Slovakia) in about 1884 with his family, including his younger brother Joseph H. Hertz, who became the Chief Rabbi of Great Britain. Both went to City College and then Columbia University. The former went to Columbia Law and was admitted to the bar in 1895, while the latter received a PhD in Philosophy in 1894. In the same year, Joseph Hertz also became the first to receive a rabbinical degree from what became the Jewish Theological Seminary. From the time he was at Columbia, Emanuel Hertz had a passion for all things connected to Abraham Lincoln. This interest resulted in many publications and, by the time of his death in 1940, the largest private collection of material related to the President, much of it previously unknown. He donated 20,000 books each to Lincoln Memorial University in Tennessee and the National and Hebrew University Library in Israel. In 1935, Knox College, the site of one of the Lincoln-Douglas debates in 1858, awarded Hertz an honorary doctorate in recognition of his scholarly achievements. Hertz's engagement with the Washington Heights Congregation was no less passionate. His first task was to supervise the building of a proper synagogue at the lots numbered 508-10 on West 161st Street. Although the area later became the center of a thriving Jewish neighborhood, called the "Fourth Reich" in the 1940s, the Washington Heights Congregation was the first to build a shul there. At that time, the famous shuls of northern Manhattan were in Harlem. One of the first to arrive was Congregation Shaare Zedek, which built a Moorish revival synagogue at 25 West 118th Street in 1900, designed by the brother of the future architect of the Washington Heights Congregation. 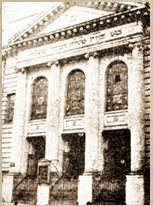 In 1906-7, Congregation Ohab Zedek moved from the Lower East Side to a grand new building at 18 West 116th Street, soon to be famous as the home of Cantor Yossele Rosenblatt. In the same years, Arnold Brunner designed an impressive neo-classical building at Lenox and 120th for Temple Israel, which moved there from its first home at Fifth Avenue and 120th Street. The interior also had classical elements, notably an aron consisting of a pediment supported by two marble columns. Above it was a stained glass window that showed Moses receiving the tablets. 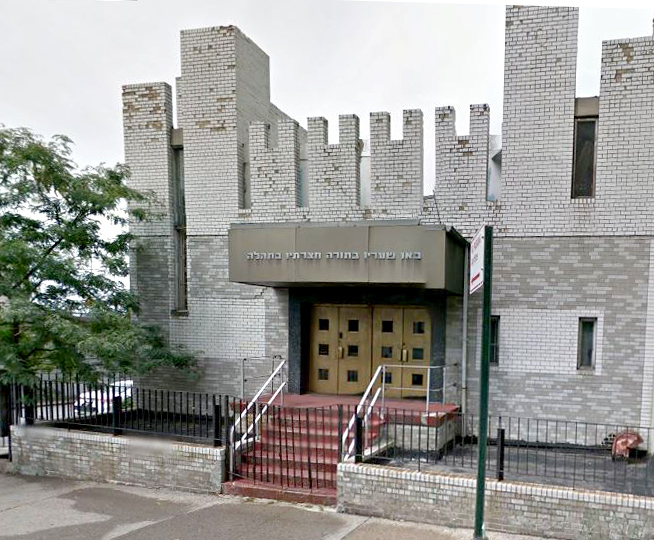 This shul at 508-10 West 161st Street was the home of the Congregation until its move to 815 West 179th Street in 1971. The old building was sold to the City of New York, which demolished it and built public housing on the land. 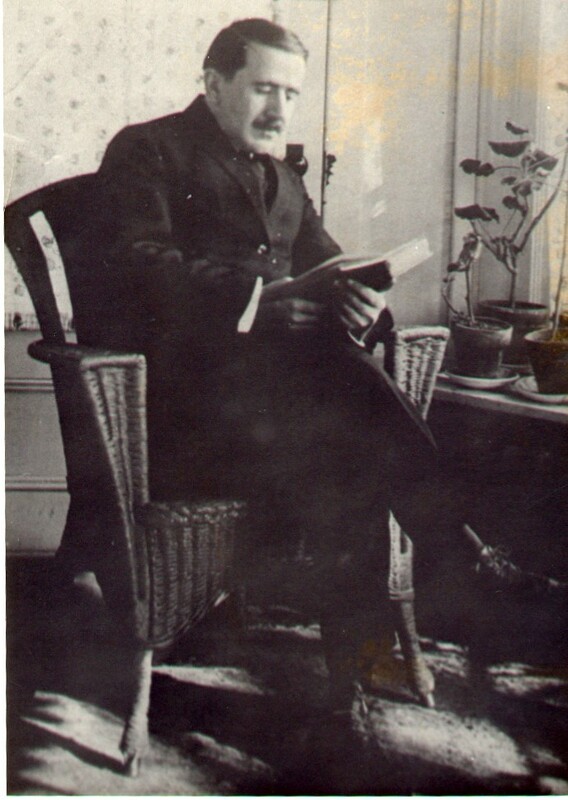 The first rabbi, hired in 1914, was Moses Rosenthal (זצ"ל (1887-1991, who later became the first president of Young Israel. As a mark of the modern part of the shul's Orthodoxy, the rabbi gave his sermons in English. Beginning in 1915, he was assisted by a sexton, Rev. Nathan Miller זצ"ל, who remained in that position for more than 20 years. Under their direction, and with strong support from the President, the shul adopted the Singer siddur and Adler machzor so everyone had the same text for davening, and singing by the congregation was introduced. They also opened a Talmud Torah, soon housed in a separate building on the adjoining lot. Its first director was Rabbi Israel Goldstein זצ"ל, who went on to become the long-time rabbi of B'nai Jeshurun, as well as President of the Jewish National Fund of America and, later, the Zionist Organization of America. By 1919, the Congregation had 205 members, while the Talmud Torah had 258 students (many more boys than girls) who ranged in age from kindergarten to 7th grade. With the appointment of Rabbi Max Drob (1887-1959) זצ"ל in 1919, the Congregation became associated with a leading figure in the American Jewish community. Like the rest of these men in the early history of the shul, Rabbi Drob was born in Eastern Europe, the descendant of a long line of mitnagdische rabbis, and he came to New York in the late nineteenth century. Combining a European with an American education, he was passionate in his belief that traditional Jewish observance was compatible with modernity. He received a B.A. from Columbia in 1908, and was the valedictorian of his ordination class of 1911 at the Seminary. He quickly became known for his outspoken support of the establishment of a Jewish state in Palestine. By the time Rabbi Drob arrived at the Washington Heights Congregation, after rabbinical positions in Syracuse and Buffalo, he was a well-known speaker who drew 500 congregants to the shul on Shabbat and a full house of 700 on the Yomim Noraim. These same skills made him an immensely successful fund-raiser, working for Keren Hayesod among other Jewish organizations. Rabbi Drob's eight years at the shul also resulted in an event of great personal significance: in 1921, he married Dorothy Littenberg, the daughter of the shul's Vice-President (and later President) Sol Littenberg. In 1927, the Drobs moved to Philadelphia, but the stock market crash altered their plans, and they returned to New York in 1929. He became the rabbi of the Concourse Center of Israel in the Bronx, a position from which he retired as Rabbi Emeritus in 1949. During the 1920s, Rabbi Drob was deeply involved in fighting the separation of traditional Judaism into Modern Orthodox and Conservative camps. A student of Solomon Schechter at the Seminary and a strong believer in Schechter's idea of "Catholic Israel", Drob was regarded as the most traditional of this group of graduates, which most famously included Mordecai Kaplan. He repeatedly spoke and wrote against attempts to disrupt "the uniformity of observance which has characterized the Jewish people throughout the ages." Rabbi Drob consistently supported Orthodox practice, vigorously opposing mixed seating and the use of organs at services, riding on Shabbat, routine autopsies, and Jewish recognition of civil marriages. He was appointed to the Board of Directors of JTS in 1922, elected President of the Rabbinical Assembly in 1925, and in 1926-7, he represented the Seminary in its negotiation with RIETS about a possible merger. Morris Morgenstern (d. 1990) succeeded Mr. Hertz as President in 1928. In that year, the Washington Heights Congregation placed itself firmly on the Orthodox side of the divide by withdrawing from the United Synagogue of Conservative Judaism. And, with the arrival of Rabbi Sol B. Friedman in 1932, the Washington Heights Congregation associated itself with the Yeshiva University community instead of JTS. Rabbi Friedman, who had been the rabbi of Congregation Poale Zedeck in Pittsburgh for thirteen years, graduated from RIETS in 1919. One of five men in that class, he also was the first one who was American born. With the arrival of Rabbi Irving Weinberg (1911-1998) זצ"ל in 1941, the period still recalled by current members begins. Born in Israel, he came with his family to Connecticut while a teenager. He learned in New Haven and then in Cleveland with Rabbi Yehuda Herschel Levenberg זצ"ל before entering RIETS, where he received semicha from Rav Moshe Soloveichik in 1933. He came to the Washington Heights Congregation after being the Assistant and then Rabbi at Congregation Agudas Achim in Hartford. He stayed thirty-three years, retiring to Israel with his wife in 1974. Like Rabbi Drob, Rabbi Weinberg was famous for his compelling sermons, which he delivered in English and Yiddish, alternating the languages week by week. In addition to his many activities at the shul, he was the principal of Yeshiva Rabbi Moses Soloveichik, an Orthodox day school founded in 1937 and located in the Talmud Torah building between 1941 and 1945. Rabbi Weinberg worked closely with Saul Nyer (1899-1993) ע"ה, President for 17 years and elected President for life when he stepped down in recognition of all he had done. Mr. Nyer was a successful businessman, a good speaker, and an excellent writer. Many people remember that his good friend, Senator Jacob Javits, came to daven and speak in the shul every Yom Kippur. Mr. Nyer, along with the previous President David Gotthelf זצ"ל, are remembered as outstanding leaders, who helped integrate the new immigrants swept here by the catastrophic events in Europe. The 1950s started with the arrival of two figures central to the life of the shul for the next decades. Chazan Shlomo Zalman Schweid (1912-2011) ע"ה, who came to the Congregation in 1950, was born in Slovakia and studied music and voice in Vienna, training with the famed cantor of the great Polish Synagogue, Emanuel Frankel זצ"ל, himself a student of Yossele Rosenblatt. In 1939, Chazan Schweid became the cantor of the Israelitische Religionsgesellschaft in Basel, Switzerland and, in 1947, he came to America. He inspired the congregation with his stirring and beautiful davening and niggunim. Even after his retirement as the full-time chazan, he returned to lead Selichot and High Holiday services. Thus many generations of shul goers had the opportunity to experience his davening. A two-part video of the celebration of the 50th anniversary of the Congregation, held in the shul in 1964, shows (in order) Rev. Schallamach, Saul Nyer, US Senator Jacob Javits, David Seidenberg, President Julius Hirsch, Rabbi Weinberg, Chazan Schweid, and Israeli Ambassador Katz. The very end of the decade saw a change in the shul's leadership. 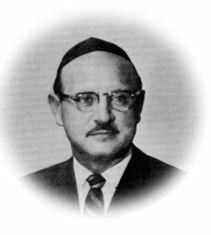 In 1959, after serving as Vice President and trusted aide to Saul Nyer, Julius Hirsch ע"ה was elected unanimously as President of our Congregation. He is warmly remembered for the enthusiasm with which he was willing to undertake any job that would benefit the shul, no matter how taxing or time-consuming. He thought “young,” and always encouraged the young people to participate and get involved in our shul’s activities. He remained President until 1989, when he moved to Israel with his wife Francys. The late 1960s and early 1970s saw dramatic demographic shifts in many parts of the city when large portions of the middle class moved to the suburbs. As the neighborhood in the southern part of Washington Heights changed, and the young people grew up and left, the Jewish institutions underwent profound changes. Many shuls closed down or merged. Others, like the Washington Heights Congregation, moved farther uptown and attempted to hold on to its next generation, while attracting the few young people who chose the neighborhood as their home. A core of dedicated people, young and old, allowed the shul to continue and even flourish during these trying times. A new era in the shul's history began in 1971, when the building on West 161st Street was sold to the city and a synagogue at 815 West 179th Street, at the corner of Pinehurst and West 179th Street, was purchased from Temple Beth Sholom (which merged with Fort Tryon Jewish Center). In 1974, Rabbi Gedalia Finkelstein succeeded Rabbi Weinberg as the spiritual leader of our Congregation, a position he occupied for the next eighteen years. He is well-remembered for his wonderful ability to capture an occasion and to pinpoint the characteristics of the Baalei Simcha. He and his wife Fredda made aliya several years ago, and today live in Jerusalem. In 1989, Leon Kahn ע"ה, became the full time Chazan of our Congregation. Chazan Kahn, who was suddenly and shockingly niftar in 2013, came from Washington Heights. He dignified our services with his uplifting and melodious tefillos. Over the years he also enhanced the shul’s reputation by inviting many distinguished guests – chazanim, singers, rebbeim and other lecturers – to appear in our synagogue. As President and then President Emeritus of the Cantorial Council of America, he participated in many community and city-wide events. Also in 1989, Martin Gruenspecht ע"ה became President. During the six years he spent in that position, he was instrumental in ensuring the continuity of our shul by nurturing a new generation of leadership. Most notably, it was during his tenure that Rabbi Ellis Bloch became our spiritual leader in 1992. He remained in that position until he and his wife Leah made aliya in 2014. They now live in Jerusalem. A member as well as Board member for ten years before he became the rabbi of the shul, Rabbi Bloch was deeply involved in all aspects of kehillah life for more than 30 years. The Rabbi's activities in the Jewish community were not limited to our congregation. Since 1997, he has been an Associate Director, Day School Education, The Jewish Education Project (formerly BJE-NY SAJES). He also served as co-chair of the board of the Jewish Community Council of Washington Heights-Inwood. In 1995, Martin Gruenspecht, after years of distinguished leadership, was succeeded as President by Aaron Bulman ע"ה. Aaron led the congregation into a period of growth and renewed hope; his untimely petirah on Pesach 2002 was a terrible loss not only to our kehillah, but to the entire community. We were, however, fortunate in having Harry Epstein assume the leadership of our shul for the next five years, followed by Yosef Rabinowitz in 2007. Both worked tirelessly on behalf of the Congregation. Bob Wolf became President in 2012. He and his wife Tamsin, along with their twins Shira and Yitzi, have been outstanding in their commitment to the kehillah and readiness to take on a multitude of tasks. After three years of service, he stepped down and Elan Rieser became President. We look forward to many successful years under his leadership. In 2014, Rabbi Yaakov Hoffman, who had joined us as Assistant Rabbi in 2013, became the Rabbi of the shul. He and his wife Giti have arrived at an important moment in the synagogue's history. While the building on Pinehurst was our beloved home for more than 40 years, our resources were not sufficient to maintain it in the face of continued weathering and long-standing structural problems. The Board and the membership decided that by selling it in a timely and responsible fashion, we could provide ourselves with the resources needed to ensure our future. In May 2014, with the sale of the building settled, the shul moved to a space rented from Mt. Sinai Jewish Center, entered on West 187th Street, between Bennett Avenue and Broadway. We look forward to our second century serving the Jewish community.